If you are on a slow connection or mobile phone, please note that some images are large and require some download time. 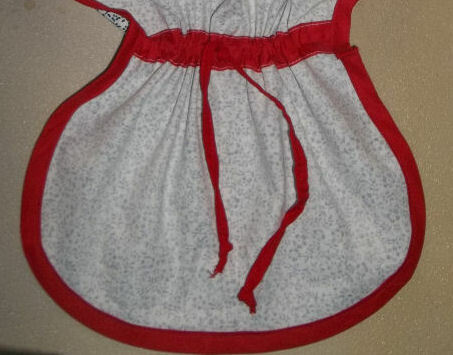 Make this really cute Button Sunbonnet Pattern yourself in a few hours. I saw it on the internet and it intrigued me because it’s a bit different from the gathered bonnets we make. I think it was called a button or snap bonnet because the cap is attached to the brim by snaps or buttons. The information on it suggested that it is a bonnet pattern that was printed in an old Work Basket magazine article. Does anyone remember those? I do……they had the most fabulous tatting and knitting patterns! Anyway, it appeared in the Work Basket in the 1950’s which suggested that housewives at the time still wore work bonnets when spring cleaning at home or working in the garden. I noticed that there were no ties on the bonnet or in the ‘pattern’. The pattern itself was actually just a sketch and though it showed no ties, nor were any suggested in the brief 2 paragraph article, I thought I would add them anyway. 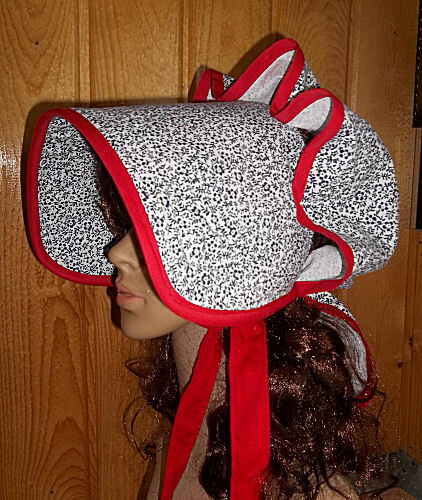 I didn’t think the bonnet would be stable enough to stay on if anyone would be doing any serious hoeing in the garden, hiking etc. So in my pattern, I simply added ties. If they feel intrusive to the wearer, it’s very easy to just tuck them up inside the bonnet during wear. This bonnet also showed a bit of lace around the edges. While that is no problem to add, in fact it’s super easy to do, the few instructions I had suggested adding trim. Adding it around the bonnet brim as well was a way to tie the bonnet all together color-wise and that’s what I chose to do. Sew the lace on if you like. It will definitely add a bit of class to the bonnet for sure! Although there were some measurements given, which I tried to follow the best I could, I think I either must have misjudged when drawing out the pattern or the drawing image didn’t quite match up. But I feel that I came pretty close. 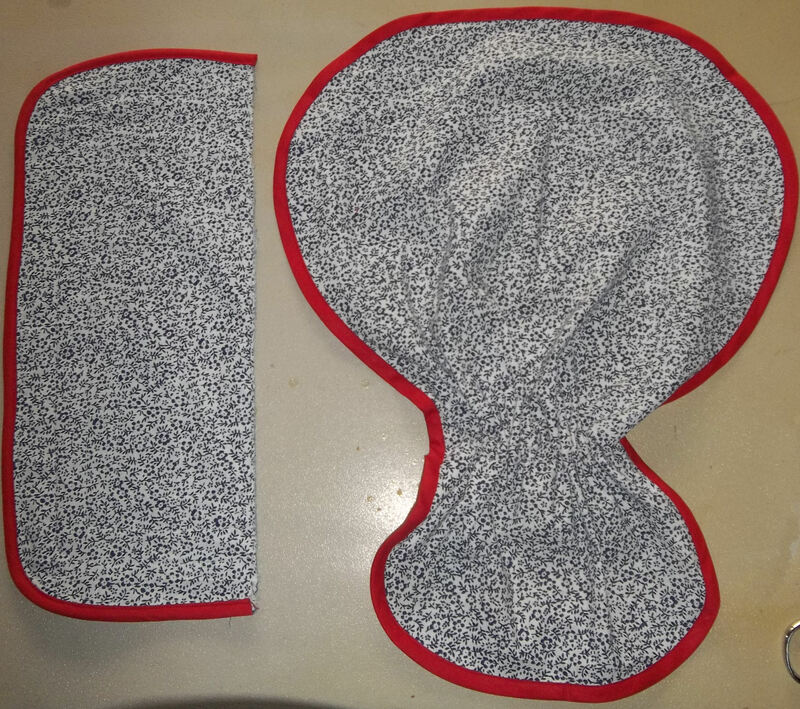 I am going to tweak the button bonnet pattern a bit til I get it the way I think it should be, but will also leave the original as a secondary choice. 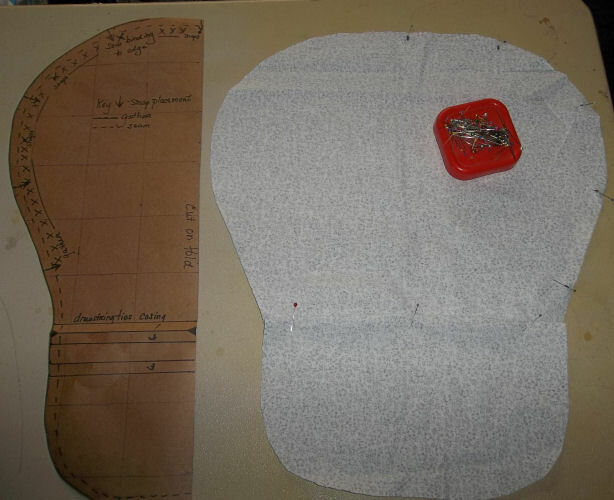 The following is what I did to make the bonnet and I did my best to include measurements when I could. At the very end, I will have the pattern pieces with measurements on them if you want to take a try at this yourself. NOTE; Most (but not all) of the images will have really LARGE files to view if you click on photo in the lower right hand corner. This will give you a closeup bird's eye view of them if you need to see the images up close. Thought I've reduced the file size as much as possible to curb slow download times. there may be still some lag due to having to leave the images large enough to see. The pattern piece at the left is approximately 20 inches long and 9 inches wide. It has to be placed on the fold to cut out the bonnet back. The squares that I lined on paper to outline the pattern piece are around 2 ¼” to 2 ½” wide and high. I placed three lines on the brown paper at what I would consider the ‘neck’ of the pattern piece and labeled them 1, 2, and 3. 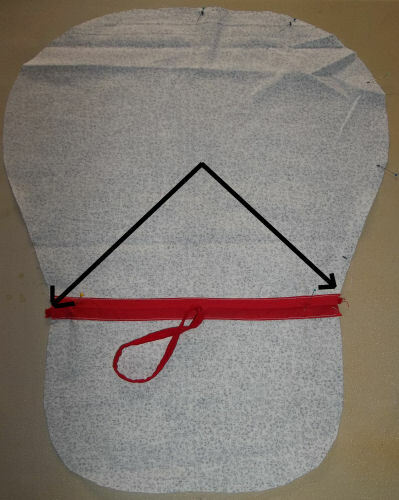 This was to mark where to fold over ( 2 being the center where the black arrow/notches are and 1 and 3 meeting at the bottom, then folding over) in order to make a drawstring casing but in retrospect, I made them a bit too close together. You can see on the right, on the material, that I had folded the material up and pinned it but it’s not even a half inch when folded. This would make it far too small to run a drawing string through. I will widen these lines later when I make a new pattern. 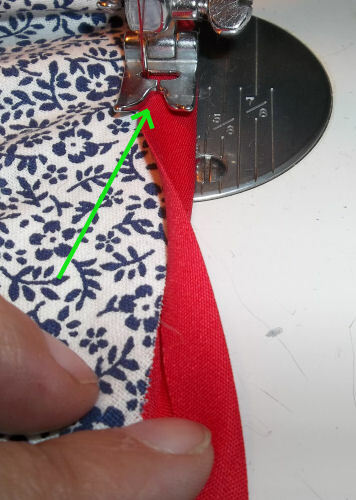 I would recommend either making these lines wider or just sewing a casing like I did in IMAGE THREE. So I chose to make a casing out of seam binding instead. I cut a tiny eyelet in the center for the drawstring to be pulled through, and then I top stitched the binding to the cap area but sewed at the base where the neckline would be. Cut a piece of material about 14 inches long and one inch wide. Fold in the long edges inward to the center, then do it once more. Press and top stitch. Pull the drawstring through the casing and at each end, keep it in place with a pin. Pull the drawstring through the eyelet and cut. I will have to make another brim as I accidentally deleted the photo. But I'll do my best to explain. I cut two brim pieces from regular material and then placed them right sides together. Then I cut one more of denim (you can also use pellon) for the interior. Because it's heavy weight material, it will give some weight and structure to the bonnet brim and keep it from being floppy. Put the denim on the top of the other two pieces, pin and then trim edges if needed. 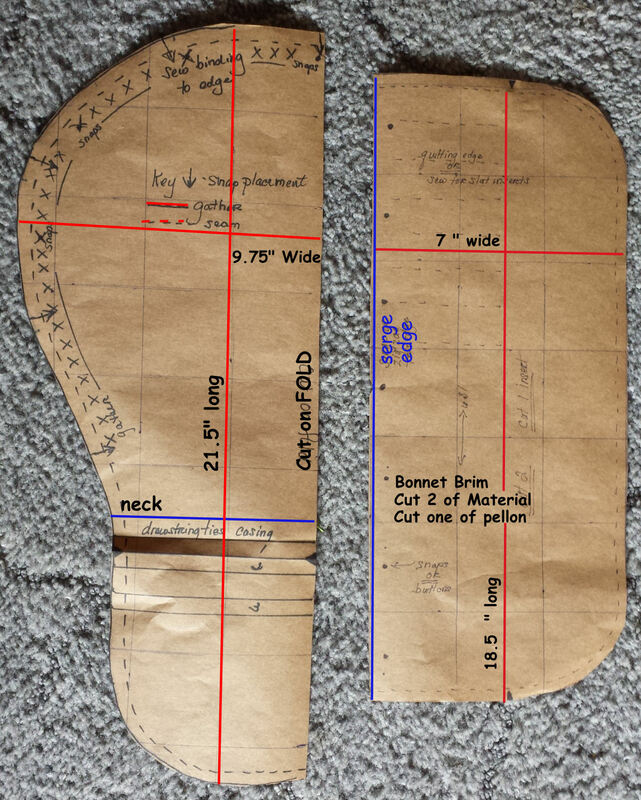 Sew around the outside edge of the sun bonnet brim about the width of the foot. Trim close to the edge, then turn inside out so that the right sides face outwards and the denim is inside. Press. Top stich the outside edge of the sunbonnet brim about the width of the foot. Working your way to the center of the bonnet, 'quilt' the brim making each successive row about 1 inch away from the previous one. Press. Then zig sag or serge the raw edges and press once more. 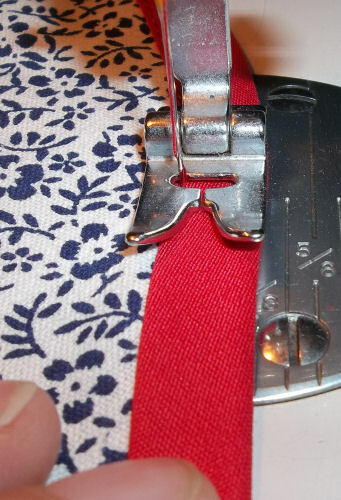 Take the binding and, as much as possible since the outside brim edge will be thick, keep it centered in the middle of the bias tape, fold over the top of the bias tape and top stitch. 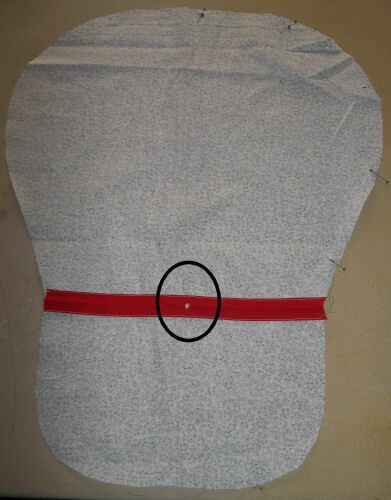 Take the seam binding and working with the back cap piece, sew the binding around the entire piece. Keep working the material to the interior center of the binding as much as possible while top stitching. Top stitch as close as possible to the seam binding edge. Ease gently around corners where needed. 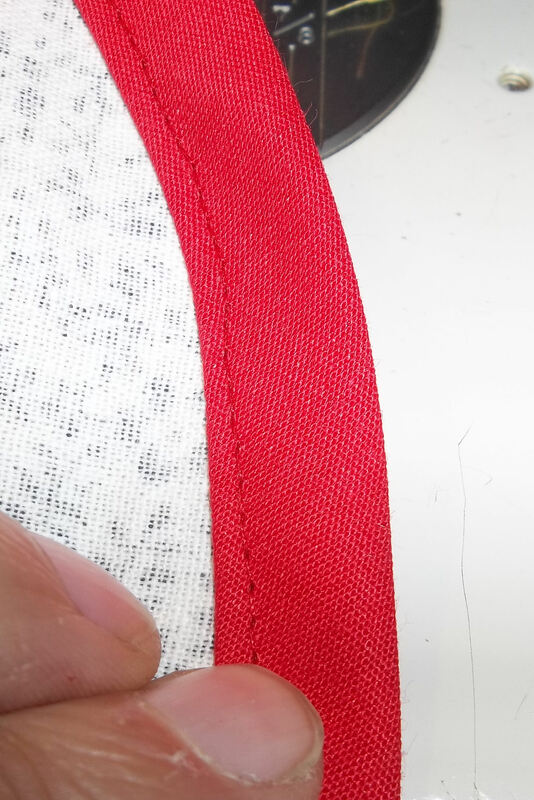 If it's been centered properly, you will see that the top stich will meet on the bottom side and will have stitched the seam binding to the bonnet brim. I marked approximately where I would like to place the buttons or snaps on the brim and then tried to measure on the brim cap where the corresponding snap parts would go. When I make modifications on my second bonnet and make a true pattern for testing, the bonnet snaps or button placement will be more certain. This gives you an idea where they should be placed. To make things as equal as possible, start with the center of the brim, then the center of the bonnet cap and mark it (BLACK X's) Then start at the neckline of the cap (BLUE X's) and match them to the outside edges of the bonnet brim. Do the same for the remainder of the button or snap placement. Sew the snaps on. Attach the brim to the snap sunbonnet cap. With the casing sewn on, the drawstring pulled through , I pulled the drawstring towards the middle and tied it. 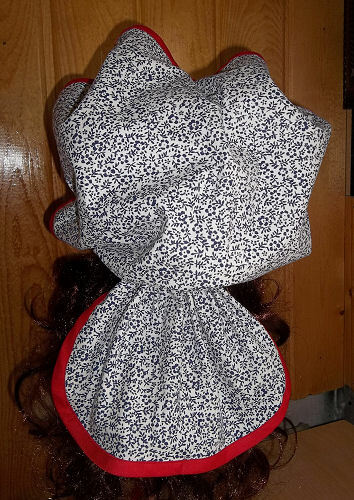 This is the rear view of the finished snap bonnet or button sunbonnet. This is the side view of the Bonnet. 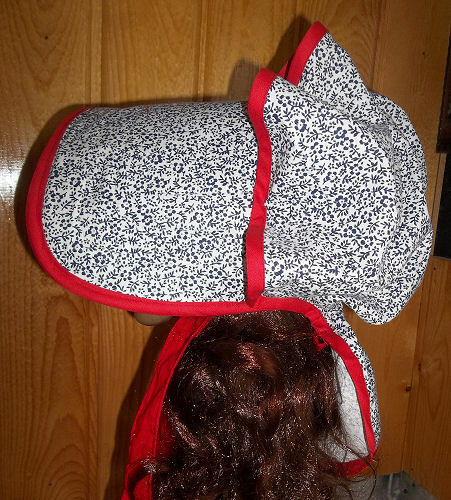 This is the final view, a 3/4's view, of the Button Sunbonnet. Using Freezer paper or brown paper, draw lines about 2 .5" apart vertically. Then draw the lines horizontally over the ones you just drew making a graph with squares about 2.5". Now draw your pattern pieces on the paper. Your cap pattern will be about 21.5" long and 18.25 " wide. or if you are just going to sew some binding to the cap to make a drawstring casing (IMAGE TWO) which is easier and faster. middle and then press. Fold in half lengthwise once more and press. Top stitch. Cut two brim pieces from regular material and then placed them right sides together. Cut one more of denim (you can also use pellon) for the interior. Because it's heavy weight material, it will give some firmness and structure to the bonnet brim and keep it from being floppy. Put the denim on the top of the other two pieces, pin and then trim edges if needed before sewing. Sew around the outside edge of the sun bonnet brim about the width of the foot. Trim close to the edge, then turn inside out so that the right sides face outwards and the denim is inside. Press. Top stich the outside edge of the sunbonnet brim about the width of the foot. Working your way to the center of the bonnet, 'quilt' the brim making each successive row about 1 inch away from the previous one. Sew contrasting binding trim to the bonnet edge. Cut two pieces 16 inches long and 2 1/2 wide. Press. These will be your ties. Fold one side over 1/4 inch and press. Fold over another 1/4" and top stitch. Repeat for the opposite side and then finfish off the bottom edge of the tie. Press once more. Pinch at the top of the tie to make a tiny 'gather' and then stitch to the underside of the bonnet about 1 inch from the back edge of the bonnet brim. Click HERE for the pattern pieces. Measurements are on it as well as my notations. Keep in mind this was just a test pattern that I made so that I could see how the bonnet would sew once I put it together. No guarantees are implied using this photo as a pattern. As time allows, I will be making a new, complete downloadable pattern with instructions.